peat under the forest floor can burn invisibly for months? Douglas-firs are not really firs? heavy snow helps some evergreens to propagate? tress can defend themselves from insect pests? soem tree seedlings can grow without being rooted in the ground? These are among a multitude of interesting facts of forest life to be found in this richly informative and appealing book. E.C. 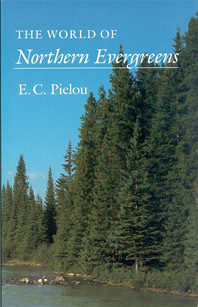 Pielou, a professional biologist, has the gift of being able to convey in everyday language her knowledge of the fascinating things to be seen ans savored in the world of northern evergreens - the evergreen forests of northern United States and Canada and on the major mountain range of eastern and western United States. The author discusses the distinctive features of various evergreen trees, providing information on how to recognisze differrent kinds. She descibes hoow they reproduce and grow, ans she assesses the impact of fire, wind, snow, ice, clear-cutting, and air pollution. Introducing the reader to many other forest phenomena, she tells of mammals, birds, insects, flowering plants, fungi, and parasites. Pielou concentrates on what outdoor people can observe on their own. Her book brings forest ecology to naturalists, birders, hikers, cyclists, canoeists, skiers, mountaineers, back-country campers - to anyone who appreciates the outdoors. Enhanced by a generous selection of drawings , The World of Northern Evergreens will greatly increase the pleasure of forest journey by making readers aware of many subtle "signs" they may never have noticed before. After absorbing it, they will look at the forest world with new eyes. E. C. PIELOU holds Ph.D. and D.Sc. degrees from the University of London. She has been a professor at the Yale School of Forestry and at Dalhousie University, Halifax. In 1984 she was awarded the Lawson Medal of the Canadian Botanical Association and in 1986 she won the Eminent Ecologist Award of the Ecological Society of America. She is author of six other books. For many people, certainly for the majority of North Americans with homes in the northern half of the continent, coniferous trees constitute a large fraction of all the "living material" they will see in a lifetime. Naturalists, hikers and backpackers, canoeists and cross-country skiers, fishermen and hunters - in fact, all whose work or recreation takes them outdoors in northern North America - are accustomed to seeing coniferous trees by the tens of millions, whether they consciously notice them or not. Outdoor people have a wide spectrum. of interests. There are many kinds of naturalists - for example, birders, butterfly collectors, rock hounds, and plant-hunters - and within each group are specialists and superspecialists. Specialists tend to specialize in "interesting" items: a birder is more likely to concentrate on owls, for instance, than on starlings; most butterfly collectors are bored with cabbage whites; and the average plant-hunter finds orchids more fascinating than crabgrass. Because of this preoccupation with the hard-to-find, the beautiful, and the unusual, most of the commonest objects in nature are apt to be ignored. They are simply there part of the background. But to assume that because a thing is common it is therefore uninteresting is a mistake. For most people, familiarity breeds indifference (contempt is too strong a word), and for most outdoor people the fact that they will no doubt encounter rank upon rank of coniferous trees in excursion after excursion in the future neither pleases nor displeases them. They don't even think about it. If there are innumerable coniferous trees in your future (and this is surely true for all northern naturalists), why not take advantage of the fact, look at the trees more closely, and learn something about them? Knowledge cannot fail to bring interest and appreciation. This book is designed to draw the attention of northern naturalists to some of the many interesting things to be observed on any journey that takes them among evergreen trees and larches (the only deciduous conifers in the North). For the purpose of the book, "northern North America" means all of the continent north of 45° north latitude. All the conifers to be found growing wild in at least some part of this enormous region are mentioned in the following pages. This does not mean, of course, that they do not also occur south of the 45th parallel. Many of the trees in our region have ranges extending a long distance southward, especially in the mountains of the West. Some even occur as far south as Mexico. More is said about their ranges at the end of Chapter 3. Learning to identify the different species of coniferous trees is only a beginning. Once you know the trees, many things can be observed if you know what to look for. There is, however, a world of difference between seeing and interpreting. Even though everyone sees the same things, it doesn't follow that everyone interprets them correctly or understands them. The ability to interpret is the hallmark of the true naturalist, and developing that ability is one of the pleasures of being a naturalist. The well-informed naturalist understands and enjoys a thousand things that the uninformed one doesn't even notice; and the more people who understand and enjoy the woods, the more there will be to protect them.